We want you to have the best results in the natural search engine results. The better your organic searches, the less advertising dollars you have to spend. Here are a few simple techniques you can use to help optimize your listing in ivacationonline.com. Title Tags. Whatever text you place in the title tag box will appear in the reverse bar of someone's browser when they view the web page. The text you use in the title tag is one of the most important factors in how a search engine may decide to rank your web page. In addition, all major crawlers will use the text of your title tag as the text they use for the title of your page in your listings. In review, think about the keyword terms you'd like your page to be found for in crawler-based search engines, then incorporate those terms into your title tag in a short, descriptive fashion. That text will then be used as your title in crawler-based search engines, as well as the title in bookmarks and in browser reverse bars. Use only 5 keywords or keyword phrases in your meta keywords tag. More than that and the search engines might think you are keyword spamming and won't list your page. The search engines rank your keywords in the order that they appear. This makes the first one the primary keyword and the second one a secondary keyword and so on. You should line your keywords up in the order of relevance to the page. Here is the meta keyword tag I used in this example. 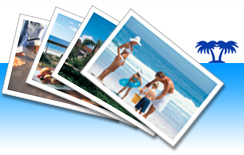 "Destin Florida Rental, Destin Vacation Rental, Destin Florida, By owner, vacation rental"
Use all of your keywords in your property description, with the primary keyword as close to the front as possible. Definitely within the first 5 words of your description. The search engines don't read your description verbatim, but can find and match them with your keyword list. So try to use them all. Only repeat them once, having them in there twice is enough. Again if your property description repeats your keywords too often the search engines might think you are keyword spamming and not list your page, so don't do it. Proof read your content twice. You should always proof read your work before you post for a lot of good reasons like spelling, grammar, placement and paragraph distribution. Once your page looks great proof read it again with your focus on keyword placement and repetition. You want your keywords placed in your content sparingly. What? You say. Again over use of your keywords might result in the search engines thinking you are keyword spamming. That isn't to say you shouldn't have too few. My rule of thumb is 3 uses of a keyword for every 300 words. This lets the search engines know that there is a lot of supporting content for the keyword. As you are proof reading you may discover that you have a much better keyword for your meta tag than what you originally thought. Use your primary keyword in the first and last paragraph of your page. The search engines will give more relevancy to your page if they find your keywords at the beginning and the end of your page. Also your primary keyword should appear in the first 90 characters of your content. Bonus tip - Use your primary keyword as a text link in your page only once. Not twice but definitely once.